Making your own ravioli from scratch isn't as hard as you may think. In fact, this recipe takes only 40 minutes from start to finish. It contains three delicious cheeses, part-skim ricotta, fresh goat cheese, and grated Parmesan, and 5 grams of fiber to keep you full longer. Our recipe makes six servings, so make this easy homemade ravioli recipe for friends and family! 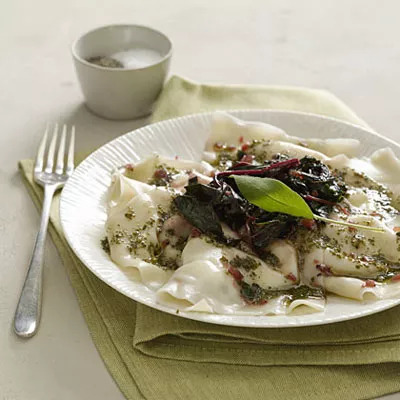 Ingredients: Shallots, red Swiss chard, part-skim ricotta cheese, goat cheese, Parmesan cheese, sage, wonton wrappers, pesto, olive oil, pepper.